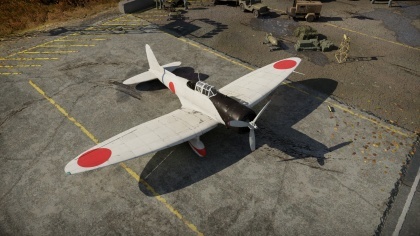 The D3A1 is a Rank I Japanese dive-bomber with a battle rating of 1.3 (AB/RB/SB). It has been in the game since the start of the Open Beta Test prior to Update 1.29. The D3A is a highly maneuverable but lightly armed dive bomber. It is very capable of pulling of some rather drastic defensive maneuvers when under attack. Once the bombs have been dropped, it can give many of the fighters it faces a run for their money in dog-fighting. This agility comes at a cost, however. The D3A is not nearly as sturdy and therefore cannot take much punishment. It also is rather lightly armed, with the relatively ineffectual Japanese 7.7 mm machine guns and a bomb load of only one 250 kg under fuselage bomb with two 60 kg light bombs under the wings. It must be said, however, that this is more or less sufficient against the biplanes and light vehicles that it usually faces at its battle rating. Tip: Taking off in simulator battles Hands-off carrier take-off (Auto engine control, no secondary weapons): Start engine, flaps: raised, elevator trim: 8% up, aileron trim: 0%, rudder trim: 21% right, WEP throttle, hands off controls until your plane lifts off the carrier. 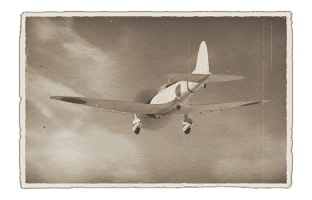 Some concerning vehicles to worry about if playing this plane. (i.e. Japanese fighters will out turn you)--> The list of plane to be concerned is planes with 12.7 M2 Browning Heavy Machine Guns and/or cannons. Those planes will easily shred you because of their firepower. The D3A1 does not like to take battle damage and a short burst from any of those planes with those weapons will either cripple your plane if not destroy it outright. Also Spitfires should is another enemy plane to be feared because even though the D3A1 is maneuverable, the Spitfire will easily out maneuver you as well as out run and out climb you. When battling the D3A1, do not fear its firepower as its relatively weak. Always remember the D3A1 is extremely maneuverable so apply Boom and Zoom tactics if the D3A1 attempts to dogfight with you. When grinding the D3A1 its preferred to focus on grinding for the performance as the bomb load is already unlocked. The armaments should be focus last as performance is they key trait of the D3A1. This page was last edited on 20 December 2018, at 01:45.